Types: Foam, Cast-Urethane, Steel Body, Spheres, Gauge Pigs, Solubles Enduro Pipeline Services. Brands: Girard Industries, Knapp Polly Pig, Maloney Technical Products, S.U.N. Engineering, T.D. Williamson. Pipeline pigs are used to perform maintenance operations inside of pipelines, without stopping the flow within the product pipeline. Used in a multitude of industries and applications, pipeline pigs can often perform their function without causing any downtime. These devices are available in a variety of sizes and configurations and offer an economical solution to many manufacturing requirements, including batching, cleaning, dewatering, and drying. Drinkwater Products carries a full range of pigs and will help you decide which one is right for your job. The bare swab is made with 2lb foam density. The bare swab is an unaggressive, but useful pig. They are used on many water utility lines for sweeping unwanted build-up and determining the effective internal diameter of pipe. The swab is also used for drying lines after hydrotesting and has proven to be a safe pig to run if the operator is unsure of the condition of his/her pipeline. Bare swabs can also be outfitted with pull ropes to make pig removal easier. This pig is a solid-cast polyurethane pig available for 2” through 8” pipe. 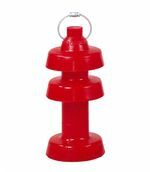 It is a bi-directional pig ideal for use in plant and industrial applications. The 8 sealing discs making it very effective in removing liquids in wet gas systems and liquid lines, as well as ideal for product batching, line displacement, and product evacuation. 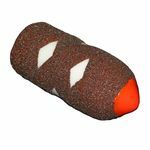 This criss cross polly pig is made with 2lb foam density and is capable of light sweeping and cleaning. The light coat of urethane makes it more wear resistant to weld slag thus allowing the pig to make longer runs than an uncoated swab pig. The blue criss cross can also be outfitted with pull ropes to make pig removal easier. Knapp's patented single-piece, bi-directional scraping pipeline pig. The K-Disc is unmatched for paraffin scraping ability. The red bare squeegee is made with 5lb foam density and is an effective pig to run for liquid removal after a hydro-test. It has also proven to maintain a superior seal when flow rates are minimal. 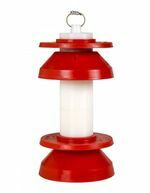 Red bare squeegees can be modified to accommodate transmitters, magnets and/or radioactive sources. Red bare squeegees can also be outfitted with pull ropes to make pig removal easier. This pig is a solid-cast polyurethane pig for 2” through 36” pipe. It is available in up to three different durometers for varying projects. The 5 sealing discs and a rear cup design is extremely effective in removing liquids in wet gas systems and liquid lines. 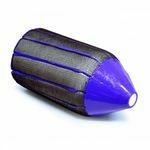 The hollow core makes the pig lightweight and uses the line pressure to expand the pig helping to create a superior long lasting seal. This superior sealing capability make it ideal for product batching, line displacement, and product evacuation. Wire Brushes may be added when more aggressive pigging is required as well as transmitters for pig tracking. 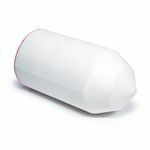 This solid-cast polyurethane pig is designed for 2" through 30" pipe and available in up to three different durometers. The unique cup design allows smooth transition with full wall seal through tees, check valves and full opening valves. 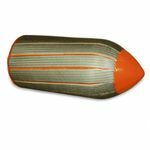 The hollow core allows expansion while under pressure for maximum performance at all times and may be used to house transmitters for pig tracking. Bolt on wire brushes are available when more aggressive cleaning is required. The Turbo Magnum is effective in removing liquids from wet gas systems and liquid pipelines. Also used to control paraffin build up in crude oil lines, separation of refined products, pipeline commissioning and product evacuation. The Spiral Wire Brush Foam Pig is a good cleaning pig for removing normal amounts of scale and deposits. The wire brushes rub against the pipe wall loosening weld slag, rust, and other unwanted agents. The spiral wire brush can be modified to accommodate transmitters, magnets and/or radioactive sources. The spiral wire brush can also be outfitted with pull ropes to make pig removal easier. This pig is a solid-cast polyurethane pig available for 2" through 8" pipe. The disc-cup design combines the effective wiping action of the disc with the superior sealing capabilities of the cup. This pig is effective in removing liquids from wet gas systems and liquid pipelines. It is also used to control paraffin build up in crude oil lines, separation of refined products, and product evacuation. 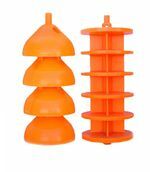 The TUFFCAST Pig combines conical sealing cups with scraping discs providing both actions in one pig. The solid cast construction makes for a lightweight and economical general purpose cleaning pig. It is made from the same tough LN-10 urethane as our line of Super Pigs. This allows for high abrasion resistance with flexibility to maintain a positive seal in out of round sections of steel pipe. The TUFFCAST Pig is available in different durometer hardnesses to meet specific pigging requirements. 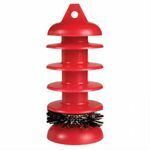 When heavy cleaning capability is needed, the TUFFCAST Pig can be fitted with carbon steel brushes or prostran brushes. The standard brush configuration on the TUFFCAST pig is two brushes, however the pig can be fitted with a single brush if requested. The TUFFCAST Pig is designed with hollow bodies to allow for the mounting of magnets or pig tracking devices. Foam disc pigs have a series of ridges or discs that help to provide extra wiping and sealing capabilities. Because this foam pig provides such a good seal, foam disc pigs are ideal for a number of applications including, product recovery and removal, de-watering, and nitrogen purges. 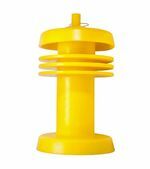 Foam disc pigs are available in both medium and heavy density urethane foam. Foam disc pigs can be modified to accommodate transmitters, magnets and/or radioactive sources. Foam disc pigs can also be outfitted with ropes or pull straps to make pig removal easier. The Optima Cast Pig can be configured with any of S.U.N. 's scraper cup or disc designs in any desired arrangement; whether it is a cup-disc-disc-cup design, multi-size cups, or paraffin cups; in any combination desired for up to six sections. The Optima Cast Pig provides the broad range of specialty cups available on the S.U.N. Super Pig with the convenience of a single piece cast pipeline pig. 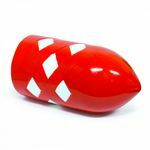 The Optima Cast Pig was designed with a hollow post on all sizes making it easy to equip the pig with a magnetic cartridge for use with the Magna-Sygg Pig Detector, or with a transmitter for use with pipeline pig tracking equipment. This criss cross polly pig is made with 9lb foam density which is stiffer and more aggressive than the 5lb criss cross pig. Like the 5lb foam pig, this one can be used in many ways including, cleaning, batching and de-watering. The criss cross urethane coating provides extra durability and allows the pig to travel longer distances without being damaged. The crimson criss cross can be modified to accommodate transmitters, magnets and/or radioactive sources. The crimson criss cross can also be outfitted with pull ropes to make pig removal easier. Available in diameters from 2" - 12", the Super Cast Pig utilizes the same design objectives and construction material as the Super Pig. The one piece Super Cast pipeline pig offers a logical cost alternative to poly foam pigs and is an ideal product for a broad range of applications around refineries, chemical plants, oil pipelines, gas pipelines, and municipal utility lines. 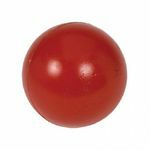 Its urethane allows it to last longer than poly foam pigs and it does not have the same disposal and contamination problems. The Super Cast easily negotiates 1.5D bends, bridge valves and tees without buckling, tearing, or shredding. The Power Brush Foam pig is used when aggressive cleaning is needed. Its heavy density foam is completely covered with tough wire brushes enabling it to remove large amounts of paraffin wax as well as hardened scale deposits. The power brush can be modified to accommodate transmitters, magnets and/or radioactive sources. The power brush can also be outfitted with pull ropes to make pig removal easier. The Urecast Pig incorporates a unique cup and disc combination which provides both optimum sealing and scraping action. 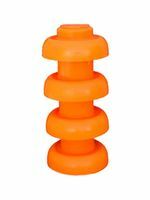 The standard Ultra-Seal Pig has flat, polyurethane elastomer discs on each end. This is the optimum design for dewatering, batching of dissimilar products, and for fluid removal in pipelines of all sizes and pipe materials. The Ultra-Seal can also altered to include a EZ launch nose for vertical launchers or low flow situations. The Ultra-Seal can be modified to accommodate transmitters, magnets and/or radioactive sources. The Ultra-Seal can also be outfitted with pull straps to make pig removal easier. The Ureflex pig is an all-urethane disc pig that can be outfitted with brushes for more aggressive cleaning. The OptionAll™ Pig is designed for light cleaning, line filling, dewatering, batch separation and liquid removal. The replaceable cups and discs make special configurations easy and its low cost gives users the option to dispose of or rebuild the pig after hard use. The Black Belt is outfitted with urethane blades molded into the foam for maximum scraping power. The tough urethane blades are great for paraffin removal. The urethane blades make it the perfect choice for plastic or internally coated pipelines, where traditional brush pigs cannot be used. The Black Belt is available in both medium and heavy density urethane foam. The Black Belt can be modified to accommodate transmitters, magnets and/or radioactive sources. The Black Belt can also be outfitted with ropes or pull straps to make pig removal easier. The UNISPHERE™ pig is designed for easy loading in an automated pig launcher for batching and displacement jobs. Gravity makes the automated launching and receiving of these spheres an easy process. This Silicone Carbide pig offers a "sandpaper" effect on the pipe wall and is great for loosening dirt and scale build-up often found in water lines. 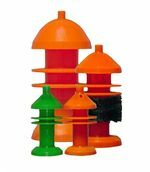 The Silicone Carbide pigs are available in both medium and heavy density urethane foam. The Silicone Carbide pigs can be modified to accommodate transmitters, magnets and/or radioactive sources. The Silicone Carbide pigs can also be outfitted with ropes or pull straps to make pig removal easier.